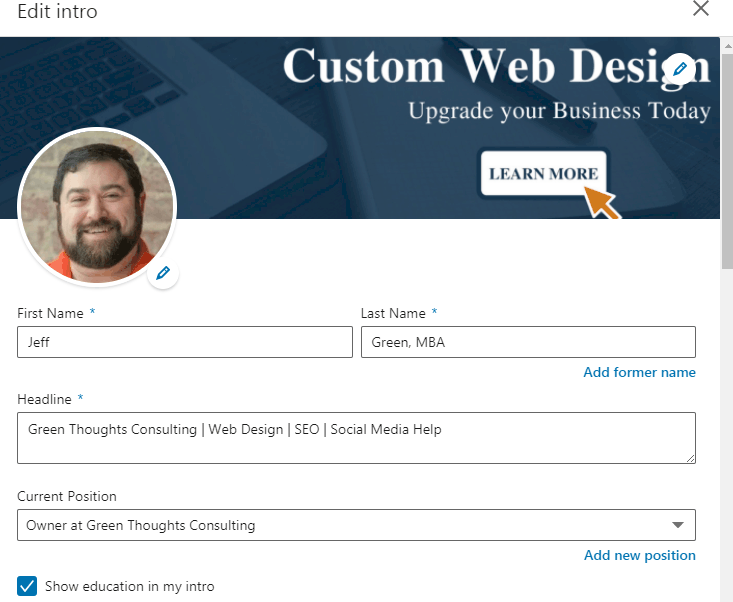 Welcome back to part 3 of the LinkedIn Profile Tips and optimization series. You can find Part 1 here and Part 2 on this page. As I have noted previously I believe that these posts are best followed with the video posted above. However, your mileage may vary so feel free to read along. 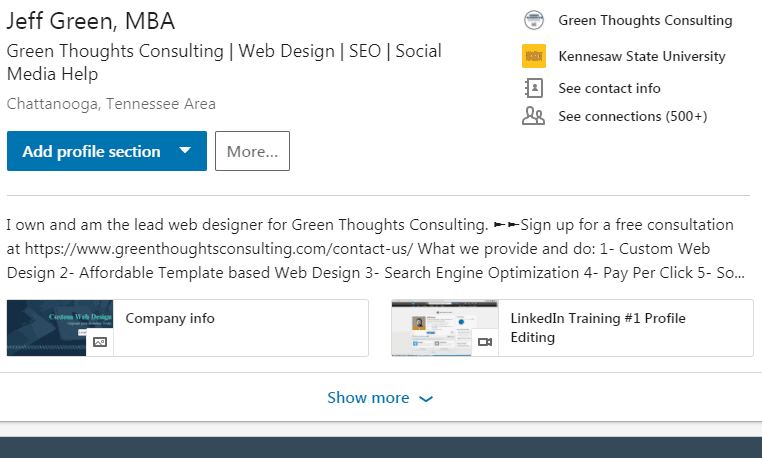 Starting on the LinkedIn home page navigate to your profile by clicking on the image on the top left. In way of review of parts 1 and part 2 we dealt with the contact area and the “top box” of your profile, as I crudely referred to it. Another area we need to discuss is the background photo or header. Choose and upload an image. It’s a good rule of thumb to match general look across your social media platforms as much as possible. This is especially true for your company business pages on Instagram, Facebook, LinkedIn Company page, etc. I’ve created a Social Media must have helper to get you started. Enjoy. A quick word about background/header/cover images on various social media outlets. I’m of the mindset that having these look the same is appropriate. Further, I feel that a best practice is to create a professional feel. On LinkedIn in particular I think this can go two directions with your personal profile. Namely, I believe you should use a well done picture of your city or territory, or just an inspiring picture with a quote or something on it. In some situations it’s nice to put a headline image on your personal linked in that explains more about your business and what you do. 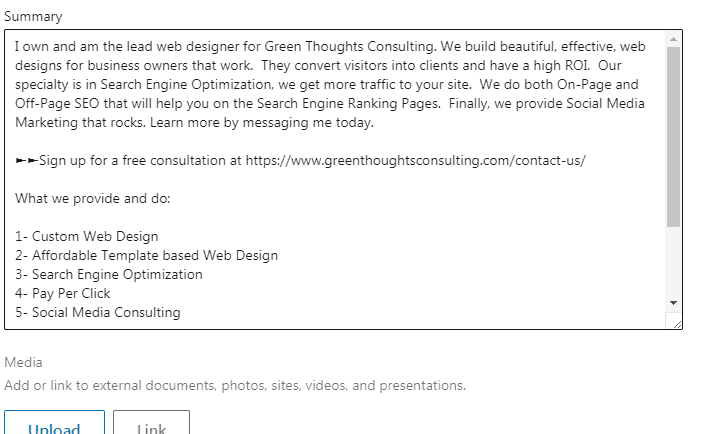 Another option is to include a screenshot of your website landing page. On the other hand, this particular post is dancing around the concept of your company page, but isn’t at this time expressly optimizing it. 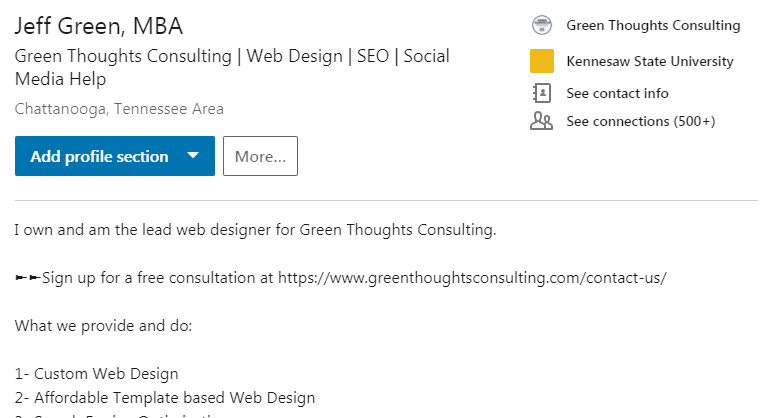 I will say, and I’ll have an entire post soon enough, that you should optimize your LinkedIn Company page with your standardized header/cover for all business social media outlets. Moving along, once you get a background image up that you are happy with move along to the next topic. On your LinkedIn desktop profile scroll down past the divider on your main profile until you see “show more”. When you click on that toggle the section expands and provides a larger amount of text “below the fold” so to speak. It’s important to optimize this top section as it will get more views than the “below the fold” information. You will notice in the image below that toggling this moves the text into a different format on the version I’m using. Compare the first few sentences to the one above and below. The text in the open toggle or the “below the fold” information is appropriately spaced. I would recommend that you work on getting the above the fold information the “show less” portion written as a block of text without spaces etc. It just looks weird when it is smashed together in the first picture above. When you write this section be sure that you focus on getting bang for your buck. This is prime real estate on your LinkedIn Profile and my main tip here is that you utilize each character wisely. What does wisely mean in this situation? It depends. Doesn’t it always? Honestly, I would encourage you to optimize it with the two or three main keywords related to your niche/industry/or area of expertise. Write sentences with the keywords in them and make sure you write for a human and not a search engine. Here is my personal updated section from above. To actually edit this section click on our common friend the pencil icon just below your header to the right. After doing so the below box will pop up. Scroll down to the Summary section appropriately labeled as such and you can drag the bottom right corner of the summary box as below in the before and after pictures. Let’s talk about Unicode HTML. LinkedIn will not allow a call to action or a button in this area. So using the Unicode HTML we can sort of create them on our own. 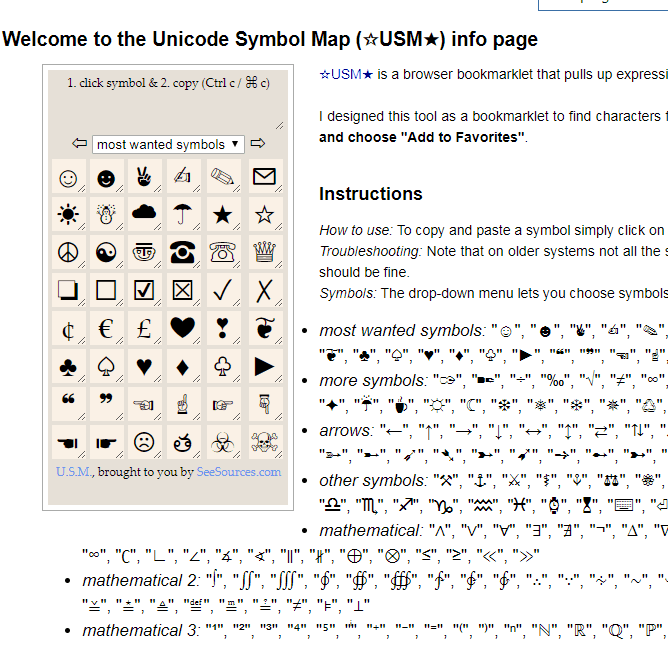 Perform a google and search Unicode Symbols or alternatively follow this link http://panmental.de/symbols/info.htm, which is what I tend to use for these symbols. I’ve provide a screenshot below of where the link and/or Unicode HTML should look like once you find it. We can copy and paste these symbols to create our Unicode HTML calls to action in the summary section of your profile. This is a work around since LinkedIn doesn’t have calls to action in the profile like buttons etc. The Unicode symbols allow us to highlight specific areas of our text so they gain needed attention. As a note of caution, do not go crazy with these symbols. You don’t want to have more than 5 or so of these in you section. Having more can look like spam and just plain odd. I would also encourage you to choose minimalist symbols such as the arrows, maybe a box or two. LinkedIn is a “professional network” so please refrain from filling your summary section with telephone icons ☎ and Chess Piece icons ♞. Stick to the following arrows, stars, circled stars, maybe a check mark. Just use your head and when in doubt just be conservative on this one. In order to actually put it in your text, simply find the symbol you want use and copy it by highlighting it and Ctrl-c in windows. Avoid highlighting the quotes prior to copy. Finally, place it using the paste function, Ctrl-v in windows, where you want it in your summary by placing the icon in the text and then hitting the paste function. To be honest this will vary wildly from one person and industry to the next. However, I would simply place three to four paragraphs about yourself that are short and to the point. Think of it as a About us page on your LinkedIn profile. It’s appropriate to add skills, areas of expertise, and career highlights as well as some family and personal life flavor. Use numbered lists or bullet points to enumerate items and make the text highly scan-able with bold and short sections. You can even use this section to provide a hidden gem or deal to potential customers, such as mention my favorite hobby and I’ll give you 10% off. You know whatever inspires interest in your reader. Go into detail about the “What” of you and your business in the summary section. This item could have easily fallen into the aforementioned Summary section, however I believe it is important enough to get it’s own section. Since I’m writing the article that’s how it ended up! At the bottom of your Summary section make a few line spaces and add the word “Specialties”. This is one of the only places on LinkedIn that I will really advocate keyword stuffing. You need to add with comma 20 to 50 keywords in this section that someone might search for if they are looking for you on LinkedIn. In an article written by Jon Shields on Jobscan.co’s blog titled, “How to Write a LinkedIn Summary: Examples and Tips”. The author confirms the above stating, “…summary content plays into the results. Your summary is not weighted as heavily as your headline or the job titles and descriptions in your work experience section, however they can still strengthen your search-ability and help you rise above similar candidates.” You can read the full article here. The article and quote above is well stated and right on in my opinion. If it’s between me and another potential business owner I want every edge I can get. As a caveat, don’t go crazy with the keyword stuffing. Use honest keywords that describe what you do, provide, etc. However, it is appropriate to do so saying the same thing in several ways such as, web design, website design, web designer, website designer, small business web design, etc. Hopefully you get the idea. Here’s a screen shot of my own specialties. The next section is probably one of my favorites on the LinkedIn profile. Just under the summary section in the edit tab (pencil click) is a section titled Media. You can add a document, an image, a link, etc. 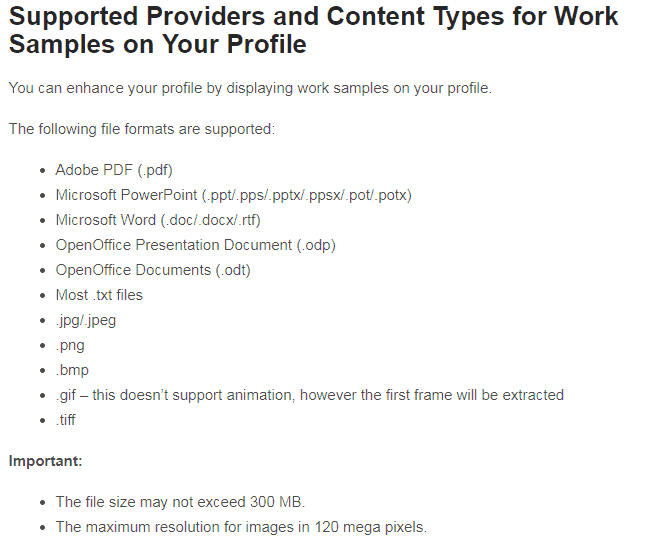 LinkedIn has a little help section there regarding the supported file types, which I’ve shown below. Think White Papers, Lead Magnets, Helps, examples of a brief, writing sample, web designs, product info and specs. So you can and should add a link to your video content or a download of anything mentioned above. However, I would attach and upload images, documents, etc., but if you aren’t willing to share and give your stuff away you might want to add a watermark or something to the document before posting. I would encourage you to add at least two items to this list. Get creative with it but stay professional. Upload your white papers, images of infographics, etc. One concept that runs throughout this series is that in order to optimize your profile on LinkedIn you need to have a clear concept of who you are, what you do, and what makes the way you do it better than your competition. Take that package it in a professional manner and makes sure it’s optimized for keywords and your are golden. If you are still stuck on what to do with your profile reach out and ask for some help or try a few of the articles provided below for a different view on the subject. If you have any other good resources or you are still stumped comment below and/or send me an email.